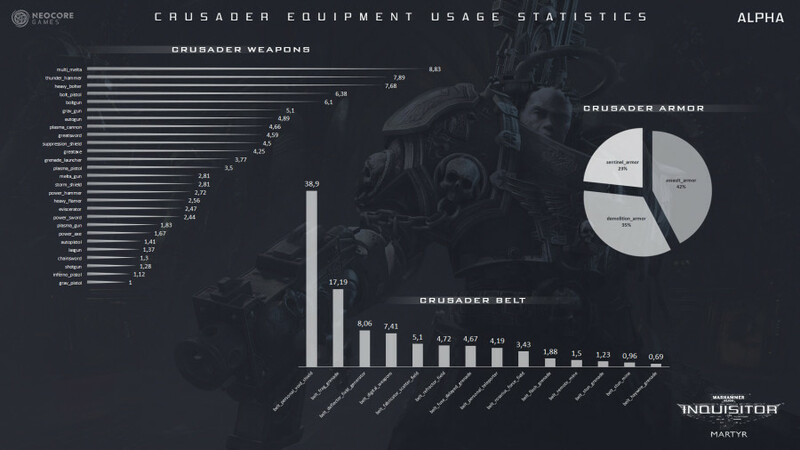 Here's a few statistics about equipment usage during the latest period of time of alpha. Well, nothing really conclusive, but it might be interesting for you, and it is certainly interesting for us to see how to balance things, to encourage players to use items they don't normally prefer. There's a lot of tweaking and balancing going on now, this is one of the areas we're looking into. So, how do you handle your equipment? What weapons and items do you prefer and why? Can you imagine situations where you might change what items you use, or do you usually stick to what's in your comfort zone? All I want is to be able to swap my weapons when I'm dual wielding. I've found a neat Force Sword with my Psyker but it had to be placed in the secondary slot, forcing me to either remap my mouse and keyboard keys or to melee attack the enemies pressing 3 on my keyboard. How can I successfully purge heretics if I have to remap my keys when I'm in close quarters combat? Most things i already guessed, like the personal void shield is just better than everything else. period. But the crusaders thunderhammer doing so mutch better than the powersword? well i guess its just up to playstyle. especially the heat mechanic i felt like heat generated way too fast, it would of felt like a better trade off if smaller heated weapons didnt generate as much heat as fast as they do. Popularity has limited correlation to balance, especially in an alpha. Popularity usually implies ease of use or fun factor, not strictly being too strong (although that can be a byproduct of being easy to use). Typically a better solution towards balance is making the items with less usage better, not strictly by buffing their stats but by making them more applicable to common situations. Alternatively nerfing items that have high popularity is incorrect because you need to understand why they are popular. To balance these items you need to give them a more defined drawback. Reducing their stats is one method but usually that results in another item just replacing it, not promoting diversified item usage. Balance is tricky, but please do not confuse popularity with balance. Will have all three classes. But will stick with alpha gear/weapons unless they get a nerf. Normally stick with what I know/enjoy and clear fastest. If the sub classes stay the same I will have one ranged and one(well 2*1hand) for crusader/assassain and a sword/melta pistol pysker. Good to know. Sorry if I came off as harsh but I used to work in game development nearly 20 years ago and I was responsible for feature creep so I was constantly involved with balance. It feels like a lifetime ago but all too often I see developers not understand how to properly balance a game despite having 100x the metrics that we had back then. I could go on for days about all the mistakes modern developers make regarding balance so I am always fearful when I see data usage charts and mention of balance in the same article. Anyway, good to hear you understand the popularity balance trap. Er...psyker data is hard to understand. Guarantee warp rods are used more than any other, by anybody who knows what they're doing. Not sure which of those items is the warp rods tho. It doesn't include crucial stuff (above), such as spells. What *is* visible is that Melee-Psyker in wayway underpowered or else players would be using more sword. 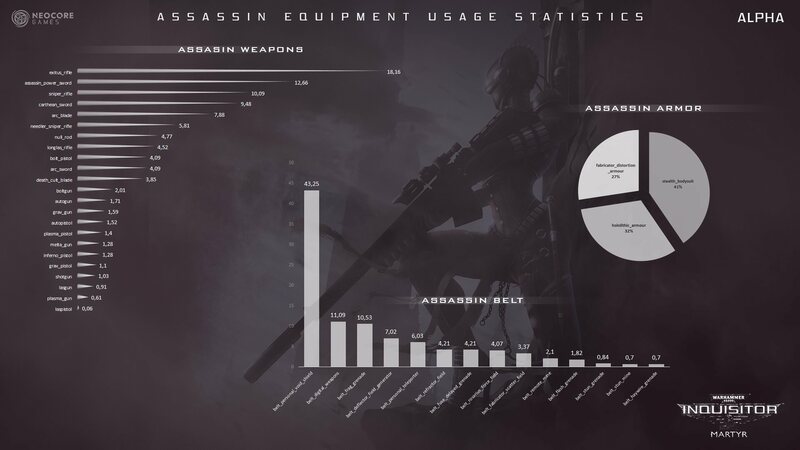 While other weapons - if we presume that they are reasonably balanced, as Hiero Glyph said - can be chosen by personal preferences or general 'coolness' - here *all* Melee combined is used by relative minority. 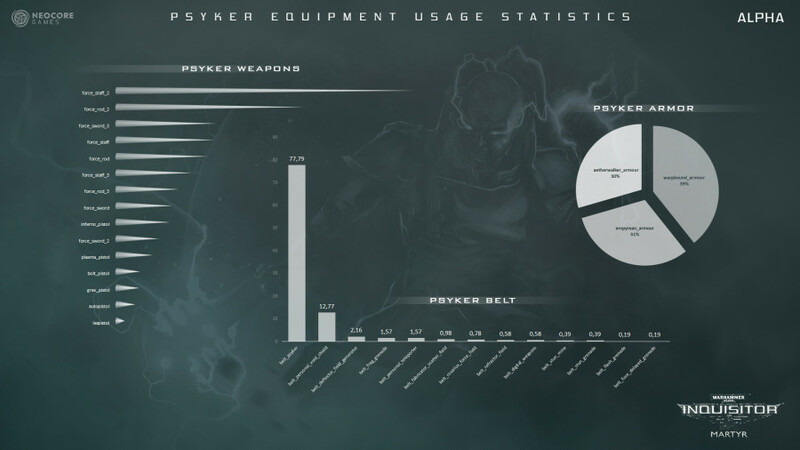 But even without that information, just knowing what gear is most popular with psykers is good, would be nice to know what each thing actually translates into, in game. This is not Pen and Paper. There is no pen. There is no Paper. There is no GM and 'off' skill will never-ever become useful, and neither the rewards for 'alternative and without bloodshed' solutions (though He seriously thinks WH40k fans would rise eyebrows on this. What there IS are algorithm-balanced opponents in (semi)scripted environment on (semi)random maps. So we need to ADAPT to this scenario (and many players use this word constantly, but never against a codex). Q: Hey, Snakefist, you seem like a kind of Caster-class! Would you like: Animal Friendship, Silence, Message, Darkness? Q: What *did* you expect from Psyker, then? - Terrify? As skill opposed/synergistic with Fearful Aura for different build or increased effect? All examples are given in Snakefist-doesn't-care form of codex numbers. For The End - He always imagined Psyker (perhaps because not playing P'n'P) as 'A Force of Nature' - well Warp, and not as a pitiful clerks which does predetermined tasks in allowed value (sorry - that's how it looks now; Warp Heat looks like a Manager who stands behind Our backs and not as balancing The Edge of Madness). As such, Psyker could be really, really cool, as if having their armour of choice free Float (which acts exactly like run, but looks way cooler) + spell it is assigned too. Psyker model is uncool, for me at least. (He has, in his Unlimited Coolness, like a million suggestions for improving 'coolness factor' of the various game details - not a time for this now, but in the future). This was most of the (mostly) negative opinions We have against Psyker as a concept as an execution, and it's of course too late to change anything, and let's wait for beta to finish and to see the reception, and then recapitulate the matter at a proper time, like Q418. We will be here, then. We always were.